It does no work for me. When I run IE 9 it does not open, it do nothing. I have tested the script with the mofications by Lancelot also. Aeolis, if the problem is incompatibility with other IE scripts, there is an option inside scripts that you might want to use. Look on the script settings, it has a box that allows you to deactivate other scripts when your script gets selected. This option was specifically made to automatically disable incompatible scripts from running at the same time. Thank you all for your help and feedback! @Nuno: I will use this feature indeed. @0scar: Please, post your build log. It'll help me a lot. But no problem during building, the script builds succcesfully. IE 9 does not work for me when I test the live-cd. It doesn't open or opens and then fast closes without any error dialog. I have tested enablig and disabling the IE 8 script. ... still testing this. But I did find a problem when first looking at it. Your pBevel3 is on top of the weblink, so although it "looks right", when you click to download, nothing happened. Remove the bevel and then you can see the finger when the mouse hovers over it. Good work though! Thanks. Edited by Tony4219, 12 December 2012 - 08:33 PM. Good news on this one! Major code revision and further testing to assure its working. Thank you all for your help. For the ones willing to help after testing, please, post you logs here with your suggestions and results regarding the script. @MedEvil: Good time to clean the off topic posts, isn't it? Please, delete them. Here is you topic back, clean as freshly fallen snow. Merry Christmas everybody! Any feedback about version 2 of the script? Aeolis, v2 and v3 of this script don't work. 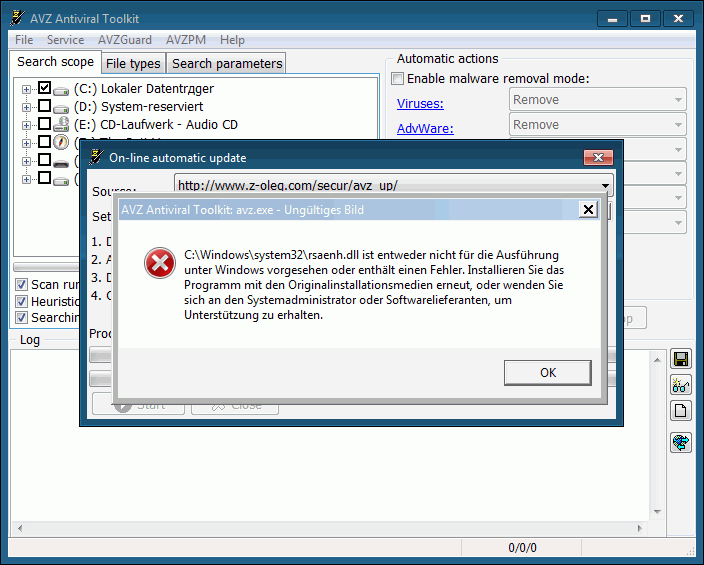 IE9 does not open in live CD. No error during building. 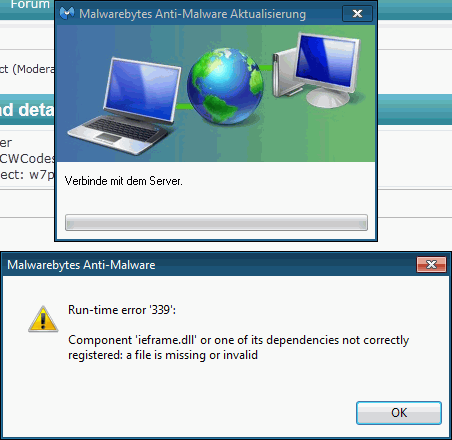 With IE8 scripts IE and malwarebyte works good. Edited by garf02, 03 January 2013 - 09:44 AM. Thank you for your feedback. I need you to do the following. 2) Run it inside your PE Build and drag and drop Internet Explorer 9 executable (iexplore.exe) inside Dependency Walker windows. 3) Save the results to a dwi file and post it here. I will figure out which dependencies are missing and fix them ASAP. Q1) Which is the Windows version of your PE build? Win7, Vista or XP? Q2) Which architecture is your build? x86 or x64? Q3) In case it is a x64 PE build. Have you added the x64 version of IE9 to the build? Hi Aeolis, there is a risk that you may already know this tip but I'm mentioning it just in case this can help you or others. When running dependency walker to get the DLL's of an executable, you will need to use the program somewhat extensively. Most DLLs are loaded on runtime but I noticed that many other DLLs only get activated/reported when I am actually using the features of the program. Hope this helps grabbing the full list of dependencies. I use dependency walker only for the first brief decisions. EDIT: BTW: It is not necessary to start the PE. You can run Dependency Walker on your PC, examinating <the candidate> in your target directory (containing the first build), by defining an order of search paths. They should point to your target directory system32 and maybe winsxs folders. For me I saved this order as target.dwp to load it quickly when examinating. Finally I use ProcMon (by SysInternals) inside the PE to decide which files (and maybe registry entries) are missing. When you followed the latest complains by sebus about non starting firewall service in multiPE: I found the missing wfapigp.dll by using ProcMon. Q3) yes, the build of IE9 is 64bit. Good news on this one! Version 4 removed the "Additional Fonts and Codepages" script dependency. Thank you all for your help. For the ones willing to help after testing, please, post you logs here with your suggestions and results regarding the script. @garf02: Please, check version 4 and see if it fixes your problem. this Version don't work on my computer. Good news on this one! Version 5 fixed (hopefully) the problems most of users had on making this script working. It's was my big mistake, so I have removed all older versions as they would only work if user had set %SystemDrive% variable in "script.project" to a fixed letter like X:, for instance. @turbobaby: Please, first try removing the dot (.) from the path of your PE project. If that doesn't work try reducing the path for you project. Generally users allocate WinBuilder as closest as possible to the root like "C:\MyProject", for instance. Good works, your new script working!!! Aeolis, I did a quick test with version 5. I tried to integrate it in my existing Win7PESE project. There's a couple of AV scripts written by homes32 I'm using with it, like this one or that one. media or refer to the system administrator or software provider for support. error message(s) and error code(s)). As you can see, errors arise as soon as I launch the program update. Any suggestions how to narrow down the problem? For MBAM, the error you described, was present in version 4 of the script. Resolved in version 5. Have you checked that IE8 is unchecked in the project? You have purge the Internet Explorer 9 cache? For AVZ the problem is not related with IE9. Edited by garf02, 14 January 2013 - 04:35 PM. I kindly ask you to post your build log. Let me check it. thanks for the offer, I did a new build and now, things are different... however not flawless. I set the Malwarebytes and the AVZ script (having had issues with some Runscanner options I made some changes there, too). Now the programs seem to update correctly despite Internet Explorer 9. That's fine! Strange enough, although I used IE9-Windows7-x86-deu.exe (hash verified), the resulting IE 9 installation is anglophone. I'm using Win7PESE x86 (SP1) and try to simply add the x86 version of IE9, no extra (IE) scripts whatsoever. The IE9 view is okay now, but obviously something goes wrong in the extraction phase. Just expected a subfolder like de-de being created (additionally to en-US and SIGNUP), but it's missing. I re-downloaded & rechecked Microsoft's exe installer, that file seems to be alright. The only way to have IE9 in the language you want is to have both base image and IE9 for the same language. If somebody knows a way of change IE9 language using base image from a different language, please, report it here and I will do my best to fix it. Usually if Windows and IE9 language differs IE9 uses English as a fallback language for GUI. After studying garf02 problem I have noticed that the only way to have Italian IE9 to run with GUI in Italian was to use Italian IE9 with an Italian Windows 7 base image. So, check your bases. And, please, post you build log. That's the only way I can help you.